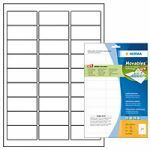 HERMA Address labels Premium A4 78.7x139.7 mm white paper matt 400 pcs. 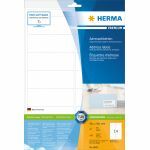 HERMA Address labels Premium A4 88.9x33.8 mm white paper matt 1600 pcs. 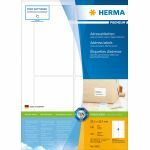 HERMA Address labels Premium A4 88.9x46.6 mm white paper matt 1200 pcs. HERMA Address labels Premium A4 96x50.8 mm white paper matt 1000 pcs. HERMA Address labels Premium A4 99.1x33.8 mm white paper matt 400 pcs. 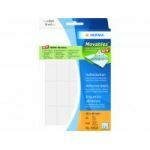 HERMA Address labels Premium A4 99.1x38.1 mm white paper matt 140 pcs. 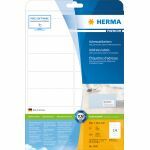 HERMA Address labels Premium A4 99.1x38.1 mm white paper matt 1400 pcs. HERMA Address labels Premium A4 99.1x38.1 mm white paper matt 350 pcs. 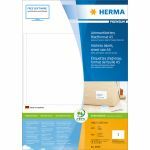 HERMA Address labels Premium A4 99.1x67.7 mm white paper matt 200 pcs. HERMA Address labels Premium sheetsize A5 148.5x205 mm white paper matt 400 pcs.